I’m not sure if I could love the hero of this story more. He’s nerdy, awkward, and brilliant. The way he sees the things around him is unique. His weakness for Clara is adorable. Clara is pretty fantastic too. I loved that she wasn’t content to just be a “pretty girl” and went out to find her own adventure. She doesn’t take no for an answer and has the unique ability to completely confound Radford. These two shouldn’t work together, but they do. Their chemistry is unmistakable and the love they share evident way before they realize it themselves. 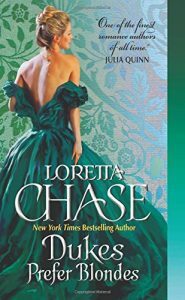 DUKES PREFER BLONDES is a romantic, funny and delightful historical romance that shouldn’t be missed.